You might be familiar with population density maps. They’re generally color coded, where red represents the most densely populated areas, and are often centered on urban centers like New York City and Los Angeles. However, we’re guessing you’ve probably never really seen an accurate tree population density map before. Well, now you have. Created by Josef Kellndorfer and Wayne Walker of Woods Hole Research Center, the data for this map was collected in conjunction with the National Geological Survey and US Forest Service. 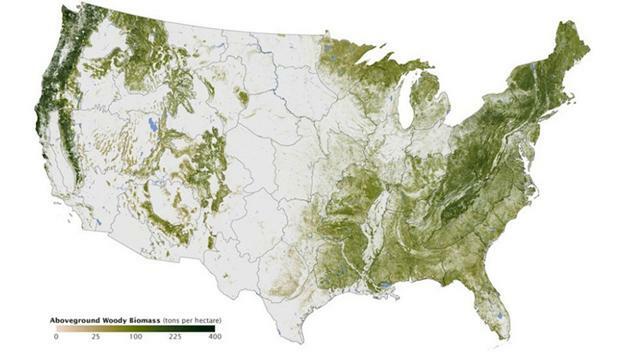 By working in collaboration with these national agencies, Kellndorfer and Walker made use of space-based radar, satellite sensors, and computer models to gather an accurate visual depiction of woody biomass across the continental USA. Apart from being somewhat humbling and cool to look at, the map was gathered for NASA scientists who are trying to decipher if the forests and trees across the US could be able to store more carbon in the future, but in order to do so, required an inventory of the trees now.